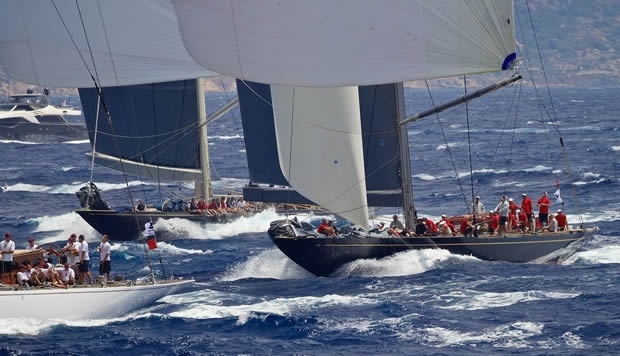 With a win in the fourth and final race, a fast 30 miles coastal course with over 20 knots of brisk sea breeze back and forth across the Bay of Palma, Lionheart lift the trophy that they consider the season’s most prestigious and hardest to win, triumphing in the five strong J Class at the Palma Superyacht Cup. Having missed out on overall victory on the last race here last year when they could not recover from a poor start, this time Lionheart fought back from a modest opening to the first upwind and took the lead when they went to the far left of the upwind, making a big gain to lead Ranger around the first buoy. From there they were challenged only when the breeze went soft at a leeward mark and the leaders compressed closer, but with excellent speed upwind and downwind Lionheart proved comfortable winners. With their second win from four races, also sharing Wednesday’s King’s Hundred Guinea Cup with Hanuman, the team which has Volvo Ocean Race skipper Bouwe Bekking as tactician win their second J Class regatta in a row, after winning in Mahon, Menorca last month. Consistency proved key for the Erle Williams skippered Ranger which took an excellent second overall, pipping last years champions Hanuman by half a point. Today’s coastal race brought the series to a fitting showdown. With just one point separating regatta leaders Lionheart from Hanuman, the latter made poor start and only on the final run to the finish did they rescue fourth place when they passed Rainbow. The well drilled, diligent Lionheart team learned from their own mistakes from Friday’s race, and their extensive post race de-briefs this time offered a pointer towards today’s improved start. Even if the five boats did not all hit the line at the same time, within seconds they were all bow to bow for a remarkable few minutes of intense action. A long fast reach down across the bay saw no place changing, but on the return leg all the way back to a mark under Cabo Blanco, Velsheda held low and were able to pop through into second which they held to the finish, their best score of the regatta. Bekking, who returns tomorrow to skipper’s duties on the Brunel VO65 in Kiel, was delighted with the Lionheart win: “This was the one we wanted to win because this is where we have the five boats. Last year we were leading until the last day and then we lost it. We had a bad start then and could not get back. Today we got a good start and got bounced back a bit but we got back into it and clawed our way back to first and from there on it was quite easy. “We have such a nice group of people and are always having a good time. We work very hard at it. We always do three full days of practice and every race we do a big, full debrief for at least 45 minutes to an hour with video integrated and even like yesterday we had a bad start and we executed on that today. “In Menorca we had speed upwind and downwind so the other guys have caught up or perhaps it is the venue a bit, some boats go really well at a venue, Ranger has gone fantastic at this event, some boats just fit certain events. “I have won a few events here so I was pretty confident when we went to the big left. I was a bit amazed the others let us go. After that it was game over. I think we have been sailing well and I think our crew work is among the best here. And the owner driver has made huge steps in the last two years and now with two events in a row it is finally paying off. Ranger skipper Erle Williams was almost bemused to have taken second, but with four times America’s Cup winner Murray Jones sailing his second regatta as tactician, and solid, dependable crew work to build from their excellent starts – they started four times off the left, pin end of the line, their success was well earned: “We are thrilled because the newer boats are fast and are being sailed well and they are hard to beat. Last year we struggled and it was hard. There are some great sailors out there sailing these boats. The whole J Class story here is a great success story, having five boats here, different winners on each day has been fantastic. But here consistency has been good for us in a tough field, we didn’t win this time, but maybe next time. “Lionheart is extremely fast, they had pace today. They were tucked in behind at the start and they just sailed around us but they are sailing well. But the rest of the boats are very even. Today we saw Velsheda sail better for second. Ranger has form as a team. The boat is set up nicely and the guys are trimming very nicely. Our sails are nice. The boat is kind of heavy and hard work at times, but I think we are sailing it well.